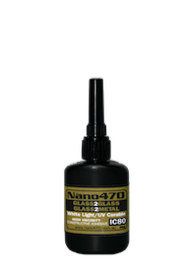 Nano470 IC 80 High Strength Constructive Adhesive. 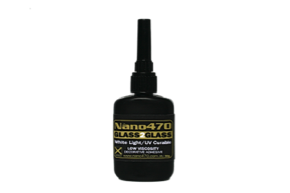 Nano470 Constructive Adhesive is used for load bearing application for glass to glass and glass to metal. See MSDS and application instructions first. 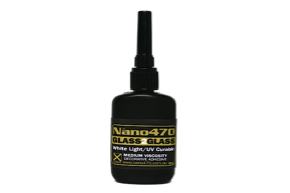 Nano470 Decorative Adhesive cures crystal clear, giving you an invisible bond onto clear glass or mirror. Not for load bearing applications. 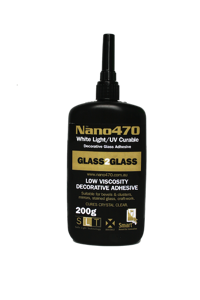 The Low Viscosity is or most popular decorative adhesive. it is a little more runnier so air bubbles are easy to get out during application. 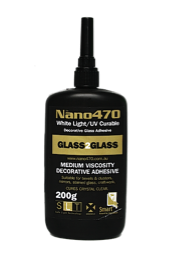 This is our most popular Decorative adhesive as it is easier and quicker to apply. 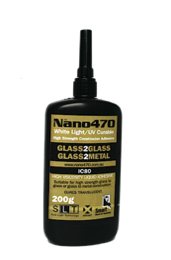 The medium Viscosity is mainly used on textured glass. Its consistency is thicker, much like honey.